St John the Baptist holds a special place in our family as he is the patron of our first child. 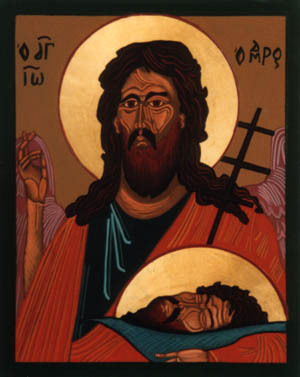 He is a man of contrasts- the last prophet and the first disciple, born in joy but dying a martyr's death. We have the priviledge of celebrating his conception, birth and death on the Eastern calendar. 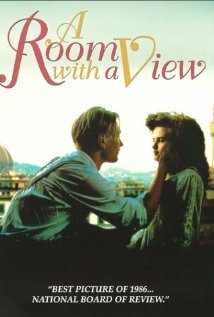 All Merchant-Ivory films make me happy (The White Countess not so much), but I just love A Room with a View. Will Lucy & George really be happy forever? 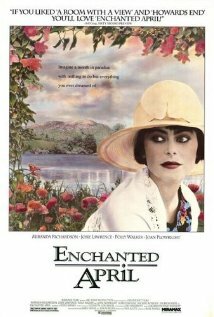 Well, who wouldn't be happy living in an Italy populated by the mannerly English and with Charlotte's blessing? Moulin Rouge, My Fair Lady, Oklahoma!, State Fair, Seven Brides for Seven Brothers, and Cinema Paradiso are others. I like a comedy that will actually induce me to really laugh out loud. 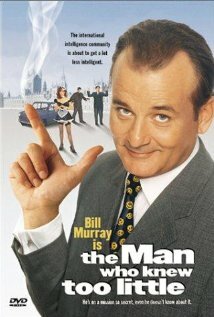 Bill Murray's The Man Who Knew Too Little is one such movie. I envy those who haven't seen it yet. You might need tissues, and the kids will shout "what's so funny" from upstairs. Strictly Ballroom, Zeigfield Follies and any 'Muppet' Movie are others. 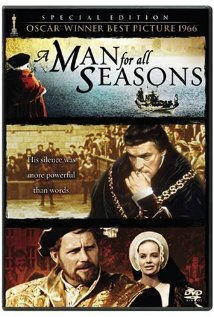 In celebration of his feast day, I'd like to remember St Thomas More with the film A Man For All Seasons. I know it is just a movie, but his sacrifice seems real. You will cry, but you will also be inspired. Paul Scofield is superb, but I also love the actress playing More's wife, Alice (Wendy Hiller- just realized she is in Anne of Avonlea as well). At the moment, she is my favorite wife in all of cinema. Many of the scenes in Branaugh's Henry V are perfectly real as well as those from Into the Wild and The Death of Mr Lazarescu. Please add your own favorite films in the comment box- I'd love your recommendations! 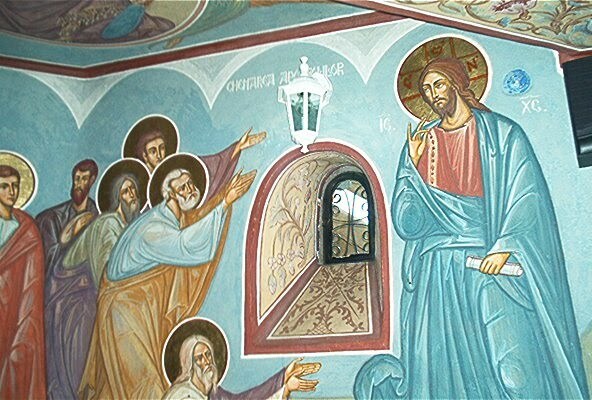 Byzantine Catholics call the sacraments "mysteries." No matter how old we get, no matter how educated we get, the full meaning of these seven great gifts of God will remain hidden from us. Theologians can study the sacraments, but if baptism, Eucharist and the rest become understood, they actually lose meaning, like the Bible does after a Jesus Seminar. Byzantine Catholics in the West are getting back to our tradition of infant baptism, confirmation and Holy Communion. No, the baby does not understand what he has received, but do any of us really? This is certainly not a call for Latin-rite Catholics to change their tradition- although I will confess it irks me that my very educated and St Bernadette-like niece had to take CCD classes and wait until she was seven- even though she looked very pretty in her dress and veil. And it also irks me that in another sister's diocese, they might delay confirmation until sixteen and older. I believe that, no matter the tradition- early or late sacraments- the graces and benefits recieved are more important than knowledge. At the Last Supper, our Lord initiated the Eucharist for our redemption and entrusted it to His Church. It was the Church which determined the prayers that were necessary to make Christ really present in the form of bread and wine. Our Church has prayed for centuries the Liturgies, that of St. John Chrysostom and the Liturgy of St. Basil the Great. The Church decided that for Christ to become present there had to be a remembrance of what Christ had done for us, and, in particular, remembering the words of institution and the invocation of the Holy Spirit. It was also the Church which decided who could and who could not partake of the Sacred Mysteries. People were excluded from participation in the Eucharist for particular sins. The Church, then, through the centuries determined more and more reasons for exclusion from participation in the Eucharist. One reason that emerged later was lack of discretion or understanding of what the Eucharist really is. For this reason children were excluded from the Eucharist until they had attained what was referred to as the age of reason or the age of discretion. In the early days of the Church, children received the Eucharist at the time of their baptism. The blessings of the mysteries of initiation - baptism, chrismation and Eucharist - are revered by the faithful. Since the faithful knew how important and valuable these mysteries were, and since, many of them were good and dedicated parents, they did not want to deprive their children of these gifts. Saint John Chrysostom noted, "You have seen how numerous the gifts of baptism are. Although many men think that the only gift it confers is the remission of sins, we have recounted its honors to the number of ten. It is on this account that we baptize even infants, even though they are sinless, that they may be given the further gifts of sanctification, justice, filial adoption, and inheritance, that they may be brothers and members of Christ, and become dwelling places for the Spirit." The Eucharist was one of the benefits for those who were baptized. The desire of parents that their children enjoy these benefits was the reason behind infant baptism. Parents do not deny their children food until they are old enough to understand the necessity of food. As any parent can tell you, food is not treated by an infant with any great respect for its life-giving qualities. But parents do not wait to feed their children until they understand these qualities. It is sufficient that the parents understand. The same is true for the Eucharist. The Eucharist is a desirable food for the many gifts that come from Its partaking. In the Churches of the East, for the most part, the Eucharist was given to children from the time of their baptism and if they were infants when baptized, they would receive Communion. The form of the Eucharist varied from one Church to another because it was a matter which was left up to each Church to decide. In the West though, the practice of delaying the reception of Communion to the age of discernment developed and was mandated by the Council of Trent. This practice gradually was adopted by our Church. We introduced something that was not part of our tradition. This is an example of latinization, which is the introduction and adoption of a Latin or Western practice into an Eastern Church. It was the decision of the Bishops of the Ukrainian Catholic Church in their most recent synod and promulgated on December 24, 1997 to restore the practice of infant communion within our Church. This was done at the suggestion of our bishops and the Vatican Congregation of the Eastern Catholic Churches. Realizing that this was on the horizon, Bishop Losten laid the groundwork in his instruction when he wrote: "In the Eparchy of Stamford, our small children who have been baptized and chrismated may receive the Holy Communion provided that the parents of the child have made it absolutely clear that they want their child communicated and that they accept their full responsibility in this matter; they normally do this by accompanying the child to Communion and presenting the child, announcing the child's baptismal name to the priest for this purpose. No one may coerce the parents in this regard. When such small children who have received Holy Communion at the request of their parents reach the age for sacramental Confession, they may participate in the Solemn Communion festivities with other children. Any child who is baptized in the Eparchy of Stamford will receive all three mysteries of initiation – baptism, chrismation and Eucharist – at the same time. The Eucharist will be received as a drop of the precious Blood of our Lord either on the tip of the spoon or on the tip of the little finger of the priest. The Eucharist will be received in this manner until after the first reception of sacramental confession. At that time there will be a first solemn Communion at which the child will receive both the precious Body and Blood of our Lord. He can minister to an actively dying person and talk down an angry ex-boyfriend. He is able to take care of a sick baby and laughs along with his children at Kung Fu Panda. He can bring home the bacon and fry it up in a pan. But if you ever want to see my priest-husband uncomfortable, you will find him sitting in the pews of a church. The pew is just not his place. His fingers will be intertwined, trying not to make any of the liturgical gestures if he is visiting at a Catholic church. And I do not really know what dance steps he was performing while sitting in the stage-style Protestant church where our son's preschool was having a concert. He just has not not had a liturgical clercial function in church since he was eighteen years old. So we don't usually spontaneously go together to a church function- like a May Crowning- where either it wouldn't be appropriate for him to be at the altar or he didn't have time to introduce himself to the pastor. It just is too uncomfortable. He is fine with not being the primary celebrant, but the priesthood is a vocation he will take to the grave and into the afterlife. He cannot help himself, wanting to be a part of the liturgical activity. It is who he is. My heart is sad for those forever priests who have left their ministry or even the Church. Even when the priest was dignified and went through the proper channels of laicization and is still a practicing Catholic and has different things going on in his life, it must be a big hole is his heart to sit in the pew as a priest forever who cannot even distribute Eucharist. I am sorry for their choices that brought them to that point, because I know how difficult it is for my husband to temporarily sit in a pew and act like a lay person. As clergy, it is not his place. Perhaps in the Roman-rite where concelebration should be "legal and rare" according to Fr. Z, it is not such a problem for a priest to sit out a Mass in the pews. But, as a Byzantine Catholic, the altar can get blessedly crowded with priests and deacons and any men or boys who will serve the altar. So my husband itches to be there. It always seems to come down to money, doesn't it? It is rather uncouth to discuss exact figures, so I will not share the exact amount that priests of my eparchy are supposed to be paid (my husband heads up two missions, so the guidelines don't apply to us in any case). The guidelines state that priests should receive an extra $100 monthly for each dependent that he has. That certainly wouldn't pay for four-week vacations, a third car (?!) and the children's educations. It covers groceries. I hope I didn't offend anyone with this post, but I probably did- just my thoughts- and I am losing followers, so I have nothing to lose...so I decided to write something just for me! 1. He is married to my mom. My father's parents divorced when he was a young adult and so did my mother's parents. I guess divorce was finally easy to come by, so the grandparents were free to live their lives without the annoyance of a spouse. My parents got married young and almost non-Christian, certainly non-religious. Mom was twenty. They had five children. It could have been a disaster, but they became Catholic, and they stayed married. Now, they have five children married and active in the Catholic Church and twenty grandchildren, all baptized churchgoers. I think this is because my parents stayed married. 2. He went back to college. Dad was about 40 when he finished up his college degree. It was a good example for us kids to see him hitting the books. And then he was able to qualify for a job that he loved. 3. He is a man of action. He built a barn alone and battled poison oak. He is the go-to guy for mowing the lawn at Right-to-Life and you might see him serving the altar at daily Mass. He is a Knight of Columbus who doesn't have much use for the socialization on steak fry nights, but he will be there to help the Knights do stuff. On the occasion that he is visiting us, he will be the one taking my kids for a hike or swimming with them. 4. He read to us. As a kid we got through some of the classics- I especially remember Peter Pan. His, and Mom's, love for reading inspired the rest of us, and we are all good readers and happened to end up with advanced university degrees. 5. He preaches to the choir. Heaven help you if you come to Sunday family dinner- the extended family is in basic agreement about religion and politics, but Dad doesn't steer clear of these subjects. I can also 'thank' Gore and Bush for distracting the family from our mini-reunion with all that hanging chad talk. 6. He smoked outside. Dad's cigarette smoking (thankfully, the habit was painfully kicked long ago) started at a time when doctors recommended certain brands and James Dean, a blond Dad lookalike, was the movie star to emulate. So, it is no surprise that Dad smoked when I was a kid. But thanks Dad for never smoking inside. You took care of us even before the 'More You Know' celebrity ads told you to. 7. He is loyal. Yes, I think one St. Valentine's card to Mom was inscribed with the very romantic message- "A deal's a deal." But in today's age of drive-through divorces and fast food churches, I think this sentiment is very romantic- like a male version of Stand By Your Man. one of Dad's favorite places- waiting for you here, Dad! I'm happy when I see my girls participate in the Liturgy with no prompting from me- when to sit, when to stand, when to cross themselves. I'm happy when my husband can be home for dinner and happy that he is a priest who goes back to the hospital to annoint a dying patient. 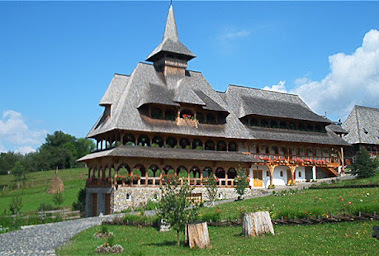 I am happy when new people come to visit our missions even when the majority of these visitors are simply looking for a temporary alternative to the Novos Ordo in the Roman rite- green at Pentecost, for example, will soon be too much for them. I am happy when a person from the old country visits even when they insist that a Protestant church is for them- it is so happy there. We are trying to build joy in the family because sometimes happiness is fleeting. My girls had a few friends over to the townhouse complex swimming pool. I reminded them that the game 'Marco Polo' was forbidden by the HOA rules (first a warning, then a $50 fine, then a $100 fine, and on and on). So the kids started with Christopher...Columbus and then Amerigo...Vespucci. I laughed, but then we had a discussion of the letter of the law versus the spirit of the law. The people neighboring the pool don't want to be bothered by the shouts and giggles of kids. While I think these sorts of people should read and meditate upon The Children of Men, I still don't want a fine. Last year's rotten pumpkin at All Hallow's Eve cost me $100. After swimming, my big girls got it into their heads to invite one of the kids for a sleepover. I called my husband to see if it was okay with him and he said no. I knew he would be reluctant because sleeping over just isn't done in the old country, but he had a stronger reason. Having a non-family member sleep in our house would most likely violate 'safe environment' practices as they pertain to clergy. So a 'real' part of our life is that sleepovers won't be a part of it. But we made the best of it. The girls made spaghetti, and I brought out a cheesecake from the freezer. And priest-husband got to eat dinner and put up some curtains before he went back to work for a bit to annoint and comfort a dying man. His 'real' is very real. Last Sunday was Pentecost- a great feast of the Church commemorating the descent of the Holy Spirit onto the apostles. The old wounds forged at the tower of babel are corrected by this act; through the power of God the Holy Spirit, the people can understand each other's languages. If you had happened to be at a Byzantine Catholic parish last Sunday, you would have seen all the vestments and altar cloths in green, not the red that is used in Western churches. For me, this choice of using a color on the opposite side of the color wheel (red and green are 'complementary' colors) symbolizes the different ways East and West look at the same truth. Red is used in the West to symbolize the tongues of fire at Pentecost. Green is used by the East to symbolize the new life at Pentecost and also to connect to ancient Jewish harvest festivals (feast of booths/sukkot). Both colors and ways of seeing the truth of Pentecost are correct- but it might have been surprising to see green this past Sunday for a Western-rite Catholic! This was an adjustment for me as well because my family always dressed in red for Pentecost; my confirmation dress was red and white. And why the semi-pretentious Voltaire quote used for my post title? Well---I love Candide and the final line was perfection. But I also was thinking of garden cultivation as a symbol for so much. Yesterday, I planted heliotrope, jasmine, tomatoes, herbs, creeping thyme and more in our tiny 12 by 24 townhouse backyard. While I was planting, it didn't matter that the yippy dogs on the other side of the fence were threatening me with growls and whines. It didn't matter that my back was hurting. It didn't matter that the baby was flirting with rolling in the dirt. I was cultivating my garden. 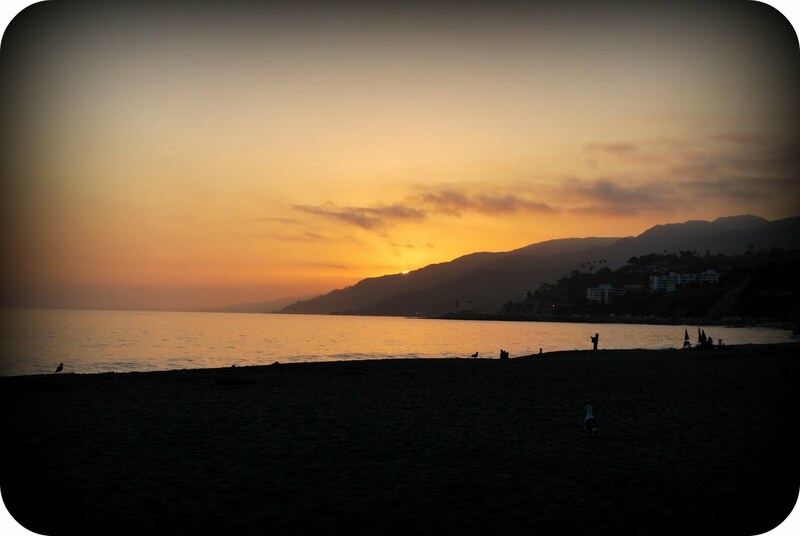 So this summer, I want to be (shall I say the word?) INTENTIONAL with my work- do things on purpose. Cultivate my garden- whether it actually be sewing or doing dishes or reading to the kids or praying--- Cultivate my garden with the help of the new life in the Holy Spirit that we find at Pentecost. It was a dark and stormy night...with interrupted sleep. I tried to offer it up...so here's a replay and I promise something new for tomorrow! Read any diet or health book. From Atkins (mostly protein) to the Hollywood Cookie Diet (just cookies?) to Oprah's latest find, there is controversy even over the amount of water to drink. The only directive they have in common is: get 8 hours of restful sleep. 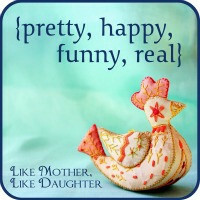 Since my first wonderful child joined us 12 years ago, I have not had 8 hours of restful sleep. In fact, lately the baby- who will be 2 in the summer- wakes up 2 or 3 times a night needing a bottle. Even when her father takes over responsibility, I still wake up. I can feel my heart racing every time she makes a peep. So how does a mom get 8 hours of sleep for her health and well-being? And it gets worse...for those women that follow the Sympto-thermal method of NFP, one of the important markers of monthly fertility and infertility is a shift in morning temperatures. One must take the temperature at the same time every morning, preferably with the same amount of sleep being had. I know for myself, I can never anticipate the amount of continuous sleep I will get. I have friends with many more than 4 kids with the baby and toddler stages going on for two decades, and I do wonder about the affect these years of sleep deprivation and disruption has on our health. Being a mom is the most important part of my life; to have the shared responsibility over four young souls is an awesome responsibility. I am well-aware of what blessings they are to me and the rest of society. This past weekend, however, has been especially difficult with minor (thank God!) illness that has made sleep even crazier. Saturday was the performance of Macbeth that the big girls have been working on since October. They had to forgo Saturday evening Liturgy, and the rest of us missed the other classes' works, but we made it to Macbeth. Father had to leave after awhile; the little kids could handle the weird sisters but not the spooky music while Macbeth was speaking. This past Monday, priest-husband and I were to give a two-hour presentation on the married priesthood in the East with a former Anglican priest, ordained Roman-rite priest with his wife. But we couldn't find a babysitter. So I stayed home and will remain a woman of mystery to the 150 people in attendance. So I can't really blog about the talk because I wasn't there. I surmise that much of it was about the fact that we aren't Orthodox and that a priest cannot be married (order of sacraments) and many of the questions were about money...so it was a wee bit frustrating that I couldn't be there. Perhaps it was for the best; I can be opinionated. "To sleep, perchance to dream"- Hamlet, my favorite melancholic, said this a long time ago and in very different circumstances. I don't want to rush my children into growing up, but maybe I would like to rush the little one into sleeping through the night. So- to help my attitude, I am offering up this struggle for some blogosphere 'friends'- one pregnant with twins (wishing her many years of sleepless nights!) and one with a little one in the hospital. 1. My boy has NEVER cried to see me go when I drop him off at preschool. Other children are heartbroken to see Mommy go- not my boy. He is fasinated by his classroom. But, he is happy to see me when I pick him up. 2. He is enamored by another boy sporting the same name in his classroom. He'll follow him around and allow the other boy to decide what game they will play. The other boy also will arbitrarily decide not to be my son's friend. 3. I found myself using his teacher's vocabulary last night. Big baby girl is very easy to put to sleep while he requires story, song, etc. We got home quite late from a dinner, but boy still insisted on being put to bed first. So no story. He was not pleased. Perhaps tonight he will make a better "choice." 4. What!? A homeschooling mom with a child in preschool? Well- I think this is the best time to go to school, and the experience has encouraged me to open the playdough and paint while he is at home. I don't want all the fun to be at school. 5. Yes- my son has more clothing than just a Lightning McQueen t-shirt. He also has a Mater t-shirt and a Lightning McQueen/Mater t-shirt. 6. Dear preschool teachers- I'm sorry that my son was such a pill the other day- demanding to sing the puppy song instead of the bubblegum song. 7. Note to self: to not need to make peanut butter and jelly sandwiches in the preschool parking lot, make sure there is bread in the house. blessed are you and it will be well with you. on the walls of your house. like young shoots around an olive tree. When we extol him We call that Virgin blessed! You fought well and have received your crowns. 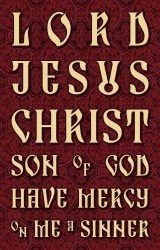 to have mercy on our souls! What's so funny about this beautiful icon of the wedding at Cana in Galilee? I just love that Jesus- God and Man- is looking at His mother the Theotokos as she is telling Him about the wedding's wine shortage. Notice how she is touching Him and their halos intersect. This is a Man who respects His mother and does what she suggests. Why should He care about a wedding party? Of course, He uses this first public miracle as a way to elevate marriage- but He also uses the miracle as a way to show that if He does what Mary wants, we should as well. So, I smile when I see this icon. In our rite, we are crowned as king and queen. So life is always perfect, right? Well, no. 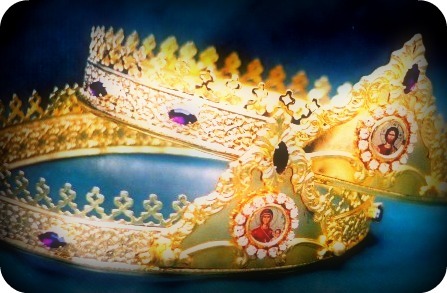 These are also crowns of martyrdom, as witnesses to Christ. ﻿God, our God. You went to Cana in Galilee and blessed the marriage there. Bless too these servants of Yours now joined together by Your providence in the communion of marriage. Bless their comings and goings, give their life a great store of good things and receive their crowns in Your kingdom, keeping them without spot or stain or reproach for ages of ages. Serious, real stuff- but marriage is serious and sometimes a bit too real- so we humans need all the graces we can get. Most pure God. Builder of every created thing. Because of Your man-befriending love You changed the rib of our forefather Adam into a woman. You blessed them and said: "Be fruitful and multiply, subdue the earth." By uniting them, You made one flesh of the two — "this is why a man leaves his father and mother and clings to his wife and the two become one body:" and "what God has united, man must not separate." By opening Sarah’s womb You blessed Your servant Abraham and made him the father of many nations. You gave Isaac to Rebecca and blessed her when she bore children. You joined Jacob to Rachel and drew the twelve patriarchs from his line. You made Joseph one with Asenath and gave them Ephraim and Manasseh as the fruit of childbirth. You accepted Zachary and Elizabeth and made their offspring the forerunner. You made the ever-virgin sprout into flesh from the root of Jesse and, taking flesh from her, You were born for the salvation of the human race. You went to Cana in Galilee with Your unexpected gift and abundant goodness and blessed the marriage there in order to show Your approval of lawful wedlock and its fruit, the birth of children. Most holy Master, accept the prayer we Your servants make: because You went to Cana, bless this marriage after coming here, too, with Your now unseen presence, and give these servants of Yours G. and B., a peaceful life, length of days, chastity, love for one another in a bond of peace, long-lived descendants, gratitude for their children and an unfading crown of glory. Let them see their children’s children, keep their bed unassailed, give to them of the dew of the heavens above and of the fertility of the earth. Fill their houses with grain, wine and oil, yes, with every good thing, so that they in turn may share with those in need. At the same time, grant to those present here with them every request helpful toward salvation. Byzantine Catholics are betrothed before they get married. This is the official church engagement. 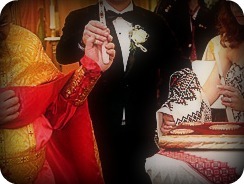 It can be done months before the wedding ceremony, but usually it is done as a part of the marriage. Here is some text of that portion of the service; it is done at the beginning, right after the priest leads the bride and groom into the church. You will notice a lot of imagery from the Old Testament throughout the prayers. Priest: The servant of God G. is betrothed to the handmaid of God B., in the name of the Father, and of the Son, and of the Holy Spirit. Amen. Priest: The handmaid of God B., is betrothed to the servant of God G., in the name of the Father, and of the Son, and of the Holy Spirit. Amen. Deacon: Let us pray to the Lord. All: Lord, have mercy. Priest: Lord our God. You accompanied the servant of Patriarch Abraham when he was sent to Mesopotamia to choose a wife for his lord Isaac. By means of a sign, the drawing of water from the well, You showed him that he should betroth Rebecca. Bless the betrothal of Your servants G. and B., and make the word they have spoken a reality. Sustain them with the holy union that comes from You, for You made male and female from the beginning and You are the One who matches a wife to her husband so that she may be his helpmate and the human race may continue. And so, Lord our God, who extended Your faithfulness to Your inheritance and Your own promise to Your servants, our fathers, Your chosen ones in every generation: Look kindly on Your servant G. and Your handmaid B., and make good their pledge in trust, concord, fidelity and love. For You, Lord, have declared that pledges be given and faithfully fulfilled. By a ring power was given to Joseph in Egypt. By a ring Daniel was exalted in the land of Babylon. By a ring Tamar’s innocence was proven. By a ring our heavenly Father showed compassion for his (prodigal) son, for he said: "Put a ring on his right hand, kill the fatted calf and let us eat and celebrate." Your own right hand, Lord, armed Moses in the Red Sea. And just as Your faithful word established the heavens and made the earth’s foundations firm, so too will Your mighty word and Your uplifted arm bless the right hands of Your servants. Therefore, O Master, with a heavenly blessing bless now this putting on of rings, and may Your angel go before Your servants all the days of their life. For You are the One who bless and sanctify all things, and we send up glory to You, Father, Son and Holy Spirit, now and ever and for ages of ages. 1. Byzantine Catholic marriage ceremonies are super superb. First of all- there are no choices regarding the readings. Wives will submit to their husbands, and husbands will love their wives as Christ loved the Church. 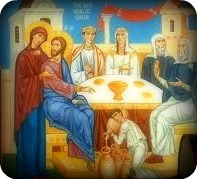 Jesus performed His first miracle at the wedding at Cana at the bidding of His mother the Theotokos. 2. All the prayers are beautiful- here are my favorite ones- said after the priest takes the crowns off the heads of the bride and groom: May you be magnified, 0 Bridegroom, like Abraham, and be blessed like Isaac and be fruitful like Jacob as you go in peace, fulfilling in righteousness the Commandments of God. And you, 0 Bride, may you be magnified like Sarah and rejoice like Rebecca and be fruitful like Rachel, rejoicing in your own husband and observing the limits of the law, for so God is well pleased." 3. During this prayer, the priest removes the Crowns from the newlyweds’ heads praying: “O God, our God, Who when You were present in Cana of Galilee blessed the marriage there, bless also these Your servants who have been joined together by Your providence in the fellowship of Marriage; bless their comings in and their goings out; make their lives fruitful for good; take their Crowns unto Your kingdom and preserve them blameless, guileless and unstained unto the ages of ages. Amen." 4. I made a total of 8 boutonnieres, 10 bouquets, 6 wrist corsages, 24 simple pew bouquets and 16 table arrangments. I volunteered to do this. Yes, I am an adrenaline junkie- flowers cannot be done well ahead of time. I think they turned out pretty well. For those curious, I used white roses, purple mini calla lilies and white/pink mini calla lilies. I could only do this because husband took Friday off work at the hospital so I could be free to do the flowers. 5. My pedicure and haircut never happened. So, I went on a search for the impossible- closed toe party shoes with a 2-inch wedge heel or less. These don't exist. So, I bought sandals and had a do-it-yourself pedicure at midnight before the wedding day. And- my hair ended up in a pony tail. It is what it is. 6. There was a lot of volunteer and semi-volunteer help with this wedding. Cheers to all who supported the sacrament of marriage by helping them have a wonderful Liturgy and party! As crazy and tiring as it is, a sacramental marriage is to be celebrated- and if it were in the old days, it would be a week long celebration. 7. Random complaints: Groom- don't invite 3 tables of strict Evangelical co-workers who say they will not come into the church to witness the wedding (because it is Catholic). They didn't come to the reception at all, and 3 tables were empty. That was a little sad spot. Another random complaint- ring bearer boy sitting with my little kids- please stop tormenting my 4 and 2 year olds through this 2 hour long church service. They are trying to keep it together. Don't encourage the baby to tear up the 4 year old's flower, and don't take the baby's headband. I was actually amazed that the little ones did such a good job...and the baby waved at everybody as we made the recessional. Also- most people- thank you for having a good time and showing that people can drink and dance and still be dignified. To a small few- you gave me good material to talk with my big girls about modesty and drinking and losing respect of others. In any case, we ask God to grant the new husband and wife many blessed years in health and happiness! I am thinking...that blogger has something against me- it keeps swallowing posts and making commenting difficult- anyone else with these problems lately?